Does it seem like every weekend dirt and sand gets tracked from one end of your RV to the other? 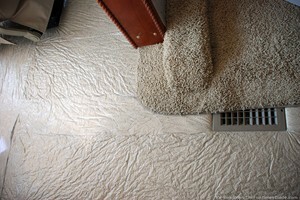 Sometimes, keeping the carpet inside your RV clean can seem like an impossible task. Lugging the upright vacuum cleaner from the house to the RV after every trip is likely to get pretty old as well. Fortunately, there is another option to help you stay ahead of tracked in dirt and grime. It’s called an RV central vacuum system! Central vacuum systems have the mechanics (or vacuum part of the system) mounted away and at a lower level than the areas being cleaned. In a house, the central vacuum is typically located in the basement or garage — with suction outlets at various points throughout the house. In an RV, the central vacuum would be mounted in a storage compartment and the suction outlets could be mounted in the floor or the kick panel of the stairs that lead to the bedroom portion of a fifth wheel trailer. RV-sized vacuum systems that operate in a similar manner to central vacuum systems installed in many homes are currently available. With the vacuum part of the apparatus set up in a storage compartment or in a motorhome or 5th wheel’s basement storage area, you can have the same convenience you have at home! Simply bring out the hose, flip open the cover to your vacuum outlet and insert the end of the hose. Whatever attachment you choose to use will be powered from the vacuum suction supplied through the outlet point. Dirt Devil, the manufacturer of many small portable vacuum cleaners, makes a complete central vacuum system that is designed to be installed in RVs. It comes with all the normal attachments, with plenty of replacement parts and extended hoses available as well. One nice central vac accessory is the RugRat turbine brush attachment for deep cleaning carpet. With RV central vacuum systems, there is even a baseboard dustpan port that allows you to sweep dirt from a tile floor right into the vacuum through a wider port at floor level. Additional inlet ports and vacuum tubing is also available for this system. Another quality brand of RV central vacuum systems is manufactured under the Intervac Design Corp. name. They also supply a full line of attachments and accessories. The Eureka Yellow Jacket central vacuum system is yet another powerful, but small, system that was designed to be installed in RVs. With a variety of central vacuum systems available, keeping things clean aboard your RV is now easier than ever! Here’s how to install an RV central vacuum system. More tips for installing a Dirt Devil RV central vacuum system. The best part: adding a central vacuum system will go a long way toward preserving the carpet inside your RV — while keeping your resale value high as well! When it does come time to upgrade you can feel confident that your investment will pay off as not only will your carpet look better, but prospective buyers will know they can easily continue to keep it clean thanks to the central vacuum system on board. Having a central vacuum system will also help to control dust and provide a healthier environment free of many allergens that seem to come along with summer and out door activities. It’s just one more way you can make your rolling apartment feel more like home.